In 1944, Walt Disney went to his daughter’s bedside to tuck her in when he saw a book called Mary Poppins. “What’s this?” He asked her. “You should read it Daddy, it could be a movie.” Walt took her advice and was enthralled by the idea of a Flying Nanny on the screen. However there was a huge obstacle to his plans, the author Pamela Travers. She wanted Mary Poppins to have nothing to do with Hollywood, let alone a cartoon-maker. Over the next several years when Walt would travel to England to make films like Treasure Island , he would pay visits to Mrs. Travers charming her with his personality and telling her about his inspiring ideas for Mary Poppins if it ever was made into a film. Finally after 16 years the author gave in to him. The next question was who should play Mary who was kind of a frumpy character like her creator. Walt wanted Betty Davis but she was unavailable, so he decided to change direction with a younger, more attractive actress. His secretary suggested the Broadway star of My Fair Lady, Julie Andrews. Walt chose her after watching her performance in Camelot and being impressed by her loud clear whistle. She chose Walt after Jack Warner rejected her for the My Fair Lady movie, claiming the actress was unphotogenic. the amazing chimney sweep dance over the rooftops. Most important, Walt was the model for the character of the father, a man with a gruff exterior who sometimes could not see past his own problems but was a nice guy underneath it all, and like Walt himself had big problem’s with banks. 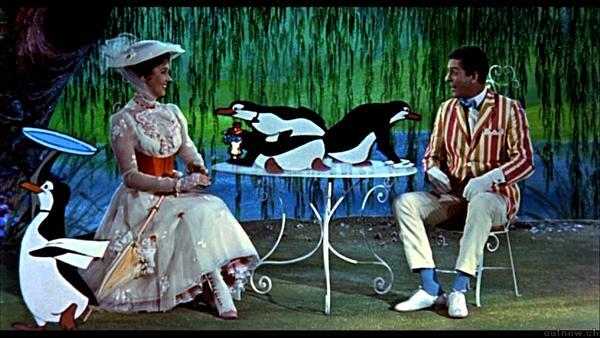 Walt Disney’s long perseverance paid off, critically and financially Mary Poppins was the greatest success of his life. This was in 1964, 20 years after he read the book and two years before he passed away. Julie Andrews even received Jack Warner’s vote towards her academy award for best actress! The stockholders, bankers and employees were almost as thrilled as Walt himself.